Fortitude Dance Project's Winter Wonderland Gala. 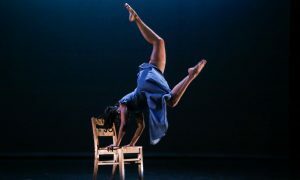 As a 20-year old college senior, Bettina Mahoney, director and founder of Fortitude Dance Project, was feeling like she wanted something more. She decided to host a dance-centered charity gala. In this event, at Randolph, MA’s The Lantana, the outer beauty of dance would meet an inner gaze on mental health. Performances were emotionally rich and visually striking. A silent auction raised funds for To Write Love on Her Arms, and keynote speaker (as well as as former dancer) Brooke Siem discussed her mental health challenges and recovery. After a delicious dinner and pop tunes filling the room, the first performance to take the ballroom floor was Pulled in Different Directions from Aurora Borealis Dance Company. The company is comprised of specifically aspiring professional dancers under 20 years old in the Boston metro area, “specializing in contemporary and improvisational dance forms and providing ample opportunities for growth, performance and inspiring experiences.” That sense of being “pulled in different directions” was present from the start, with an initial line spreading out to the spanse of the stage (those on each side moving toward their respective sides of the stage). The movement phrasework was inventive and powerful. One particularly memorable phrase was a stepping pattern with an arm sweeping under, forward and up to then leap up. 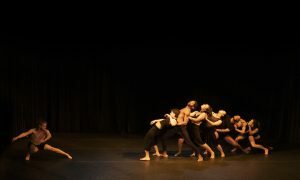 This idea of an arm – or leg or head – sweeping and pulling dancers in different directions continued into other sections, helped further build that idea of being tugged multi-directionally so key to the piece. 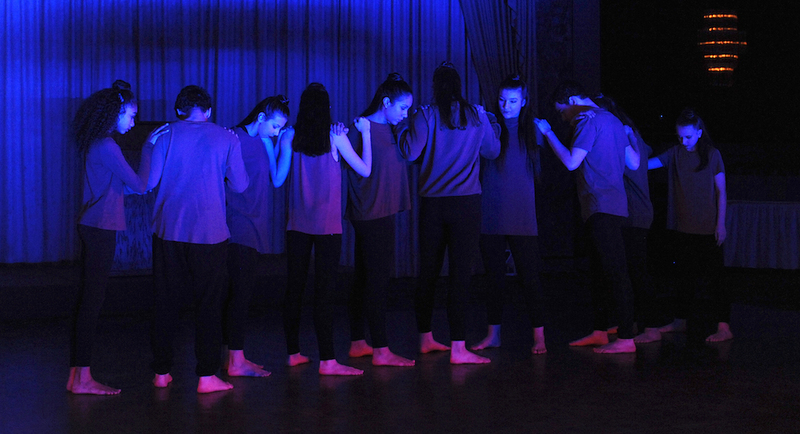 Another powerful moment offered contrast; in an “L” shape, dancers took a deep, audible breath out. It was a moment of ease and harmony in the face of the tension and a yearning for connection that filled most other moments in the piece. Varied levels in space, such as those in front at a lower level and those in back at a higher level, added to the work’s accessibility and visual appeal. Hip hop dance signatures, such as popping heels in and out with sharp accents, made the movement more diverse and layered. Throughout, the dancers stayed close yet just far enough away that they had to reach toward each other to touch, sometimes not even touch. This quality brought a poignant sense of people being together in space, yet not truly connecting with one another. All in all, the work mirrored how in hectic modern lives, we’re frequently pulled in different directions – and the result is too often missing the full, authentic truth of each other. Closing out the performances was the solo 1 AM Thoughts, choreographed by Mahoney and danced by Ashlee Rapoza. Mahoney’s voiceover began along with Rapoza’s movement. She wore all black, a blank canvas especially for nighttime. Lighting was quite low, also describing nighttime. “It’s 1am, and I’m staring at the cracks in the ceiling…and I just can’t stop thinking about him,” said the voiceover. The text came to be about something far deeper and more universal than a young woman’s romantic fantasies, however; it discussed the nature of love for others and for ourselves at large, and how those two things converge but are also in tension. The movement throughout had a true virtuosity, with jaw-dropping extensions and turns. For instance, Rapoza switched from a low arabesque to a more lifted layout, through a fouttée shift in the hips – like an agile animal alerted to a threat or food. Yet perhaps more compelling was her presence and theatricality, which offered a lightness and feeling of hope, from the joyous ease in her movement quality to her easy smile. This felt aligned with the light, floating quality in Mahoney’s voice, together bringing a sense of hope even in the face of the heavy topics at hand (romantic love, love for all people, self-love and the difficulties inherent in them all). Rather than discordant, it all seemed right and pleasing, particularly with the uplifting sense in which the voiceover text ended. There was a sense that no matter what would transpire, authentic love for humanity itself could prevail. After the performances, Brooke Siem took to a podium to give a keynote speech. She described her process of recovering from depression and anxiety. What might have perked up the ears of the dancers and dance enthusiasts in the room was Siem’s discussion of how her dance training played a large part in how she expressed her thoughts and feelings, fit in with family and friends, and coped with hardship – even, such as in her father’s death, tragedy. She recounted how, being trained to cover up personal difficulty and pain for the sake of the performance, she learned to shape the outward appearance of her thoughts and feelings to be unique, contrary to those of others or simply unexpected. 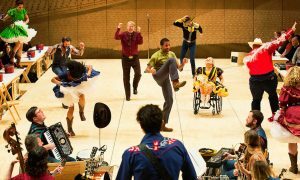 Perhaps this had wheels turning in the heads of choreographers, dance educators, studio owners and performers in attendance about they way they relate to emotion, cognition and how both appear out there in the world in dance art – and how that spreads into life. Just maybe, some may act according to those thoughts to work toward greater authenticity, care of self and other, and overall wellness in dance. Mental health challenges of course spread beyond the field of dance, but with this gala, Mahoney demonstrated that dance can have a central role in the public discourse around those issues. Dance has the power to catalyze a healthier, happier world. That can even happen with fancy dresses, great food and pop hits playing!